t takes a unique sort of courage – some might even say bravado – to run a business in tough times. In the face of a wobbly job market and bleak financial forecast, the temptation to hunker down and avoid taking risks is strong. Yet in recent years, an impressive number of Sandpointians have willingly rolled up their sleeves and set up shops of their own. Is there some special element found in northern Idaho’s heady mountain air, bracing blue water and towering firs that makes it a sizzling spot for start-ups? Meet three ambitious, high-energy entrepreneurs who are making a meaningful contribution to the local economy, right here on the shores of Lake Pend Oreille, as their business markets stretch across the country and even overseas. 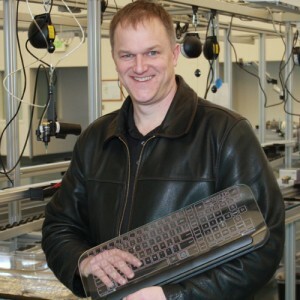 The tech industry was all abuzz last January when Sandpoint-based TransluSense – a scrappy David facing down technology Goliaths like Samsung – took first place in the prestigious Last Gadget Standing contest at the 2013 Consumer Electronics Show in Las Vegas. “It captures people’s imagination and gets them jazzed,” said TransluSense founder, president and CEO Jason Giddings, 45, of the prizewinning device. He’s talking about the Luminae, a futuristic-looking, light-driven glass keyboard and touchpad. A clear cling-on overlay designates the keys and can be fully customized for the needs of specific industries, using software also supplied by TransluSense. Giddings, a Spokane native and former Army helicopter pilot, earned a four-year degree in aerospace engineering from Embry-Riddle Aeronautical University in Prescott, Ariz. After a stint in Boise working on race airplanes, he worked at Davis Tool for seven years before founding Giddings Product Development in Forest Grove, Ore., to provide research and development services to small companies. Fast forward to early 2012, when Giddings floated the idea for a light-driven input device to technology-oriented followers of the Kickstarter.com crowdfunding website. The idea soon caught on, went viral and attracted enough funding to make the project viable. Giddings had some decisions to make, and he had to make them quickly. “My wife and I knew that if we were going to commit to a brick-and-mortar manufacturing facility, it had to be located somewhere we wanted to live,” Giddings said, “so we chose Sandpoint as a good place to build the company and raise our daughter.” He has many positive things to say not only about Sandpoint’s natural attributes but also about the support he’s received from state, city and county officials. “Idaho is a good place for business,” he said, citing benefits ranging from tax incentives to assistance in finding an appropriate building. TransluSense set up shop in a former call center on the Coldwater Creek campus, where a sea of cubicles has been remodeled into a cavernous, uncluttered space housing state-of-the-art assembly equipment, flanked by a few small offices. Giddings expects the Luminae to start shipping in August 2013. If all goes as planned, TransluSense will expand from its current five employees to a maximum of 130 employees by mid-2014, producing about 100,000 units per month. The next major product slated to roll out after the Luminae is a keyboard that self-sanitizes using ultraviolet light, for use in hospitals and other medical environments. Giddings advises anyone with a bright business idea to first investigate Kickstarter, the world’s largest funding platform. “It’s a potential source of funding,” he said, “but it’s even more useful as a test bed where you can get good feedback. Blunt feedback,” he said, grimacing. Giddings also feels it’s important to give back to the community. For example, TransluSense recently cosponsored a Sandpoint team in First Lego, a competition in which kids ages 9 to 14 use Lego® products to build robots. “The workforce of the future,” Giddings said. He meant the kids. And maybe even the robots. For more information, visit www.translusense.com. 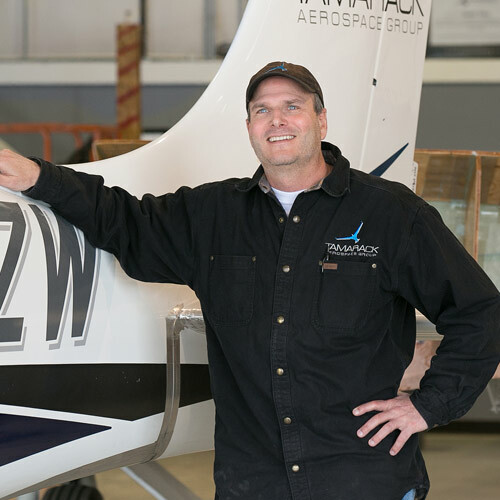 Nick Guida: Tamarack Aerospace Group, Inc.
From the outside the hangar is nondescript, with only a modest sign to distinguish it from its neighbors lining the runway at Sandpoint’s small airport. Inside, however, the large, open space hums with energy, a beehive of innovation in action. While mechanics work on planes, a team of engineers huddles in deep concentration over a bank of computers. Clearly, this is a place where serious work gets done. 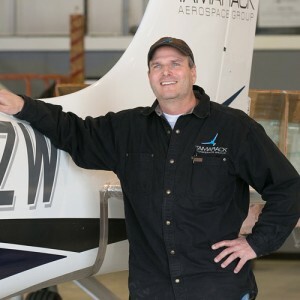 Founder and chairman Nick Guida, 46, formed Tamarack Aerospace Group, Inc. (TAG) in 2010 to help airplane owners “get more out of their aviation investment,” according to the company’s mission statement. Tamarack develops supplemental type certificate (STC) products that are modifications for aircraft aimed at improving some aspect of the aircraft’s performance. One example is an engine control modification for the Cirrus SR22 that returns manual control of the propeller RPM, allowing the pilot to reduce fuel burn and propeller noise. Most importantly, everything can be done in-house in a short time frame. A potential game-changer, however, is Tamarack’s patented Active Winglet™ that reduces drag and increases fuel efficiency (typical for a winglet) without requiring the usual extensive structural reinforcement (unique). Already approved for the Cessna CitationJet and the Cirrus SR22, the technology could revolutionize winglets for the entire aviation industry. It would appear that Guida has jet fuel running through his veins. Growing up in Maryland, he developed an interest in aviation at an early age. At 16 he was flying and skydiving. After earning a degree in aeronautical engineering from Georgia Tech, his work as a consultant took him many places, including overseas. Eventually, a stint as chief engineer at Quest Aircraft landed Guida and his family in Sandpoint, where they opted to put down roots. He is also a Designated Engineering Representative, meaning he holds a special delegation from the Federal Aviation Administration to make official engineering findings for aircraft structural modifications and repairs, on behalf of the FAA. Tamarack currently employs 15 full-time and two part-time employees, a mix of mechanics, engineers and IT professionals. According to an aviation industry website, the tough economy has slowed sales of new planes, meaning owners are more interested in improving their current planes. The forecast calls for blue skies ahead, as Guida sees the opportunities in aviation as virtually limitless. “We’re getting some great traction with big-name aviation companies,” he said. While he thinks Sandpoint is a great place to live and run a business, he admits there are a few challenges, such as needing a specialized pool of tech-savvy workers and accepting a moderate-to-high employee turnover rate. On the plus side, Guida cites Sandpoint as a friendly place where it’s easy to get to know people. “And you gotta love the ‘rush minute,’ ” he added. “Other places have a rush hour,” he said, grinning. “Sandpoint has a rush minute.”To learn more about TAG, visit www.tamarackaero.com. First, the important stuff. Yes, there is a real dog behind Laughing Dog Brewing. His name is Ben and he’s a yellow Lab belonging to company founders, Fred and Michelle Colby. Like others of his breed, Ben appears to be constantly smiling. You would smile, too, if you got to spend most of your time in a cheerful place like Laughing Dog, which Ben gets to do. Dogs are welcome in the taproom, along with their humans. Laughing Dog Brewing was founded in 2005, when executive brewer Fred Colby, 49, left a corporate job to pursue his interest in handcrafted beers. When asked why he and Michelle chose this location for Laughing Dog, Fred said, “It’s a beautiful area. I’m a Sandpoint native. Growing up here, I took it for granted. Now we really appreciate it.” He said Laughing Dog also receives “a ton of community support.” On the flip side, he mentioned that shipping product in and out of a small town can be a challenge, especially as the company grows. Also, he has needed to hire from outside the area to fill certain positions, like brewers. What advice does Colby have for fledgling entrepreneurs? “Make sure it’s what you really want to do,” he said, “and realize that sometimes the business owner comes last,” that is, in terms of paychecks and vacations. In 2011 Laughing Dog moved from its former location to roomier premises on Fontaine Drive in Ponderay. “Even though we moved to a larger location, we’ve had to rent another warehouse,” said Colby, a testament to a robust business. Today, the company’s “Fetchingly Good” beers and ales are sold in 40 states, and Laughing Dog is the first Idaho brewery legally permitted to export to Canada. More than 15 different beers, many of them award-winning, are produced in the 15-barrel on-site brewery. Some of the brews are seasonal, like Huckleberry Cream Ale and Cold Nose Winter Ale, while others are produced year-round. A current favorite is Purebred A.P.A. Citra, a single-hop pale ale that showcases a variety of hop called Citra. Laughing Dog Brewing also gives back to the community by sponsoring a range of worthy causes. This summer, as in the two previous years, “Team Laughing Dog” will participate in the annual Race Across America bicycling event. In 2013 the team will raise money for cystinosis research and awareness (see story, page 17). 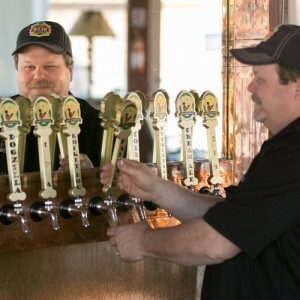 In 2012 Colby became a minority partner in a second brewery, the Belgian-themed Selkirk Abbey Brewing Company in Post Falls, Idaho, that celebrates its one-year anniversary with a special event June 29. “Selkirk Abbey is my creative outlet, where I get to play with beers we don’t make at Laughing Dog,” he said. His good friend and business partner in Selkirk Abbey, Jeff Whitman, echoed Colby’s thoughts about why northern Idaho is a great place to make beer. “You can’t get better water for brewing,” he said, “along with the finest quality grain, hops and yeast.” Selkirk Abbey brews eight-barrel batches of five year-round and four seasonal brews. Schedule a date night with your dog at Laughing Dog Brewing, 1109 Fontaine Drive, Ponderay, 263-9222, www.laughingdogbrewing.com. 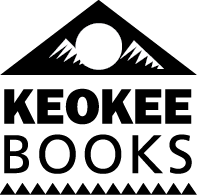 Summer hours are Monday-Saturday, 11 a.m. to 8 p.m., and Sunday, noon to 5 p.m. 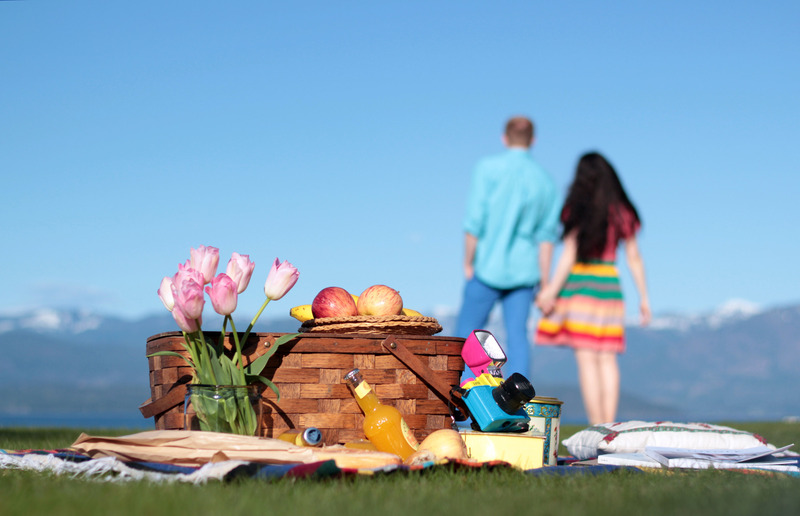 When you’re down in Post Falls, visit Selkirk Abbey, 6180 E. Seltice Way, 292-4901, www.selkirkabbey.com (call or check website for summer hours). While Guida, Giddings and Colby all appreciate Sandpoint’s natural beauty and matchless recreational opportunities, all three will attest that nothing replaces patience, planning and persistence when it comes to running a business, especially a start-up. Even though there’s no guaranteed formula for success, these entrepreneurs shared some common wisdom: Do what you enjoy, and take it seriously. Know your customers, build a top-notch team, harness the best technology and manage your resources wisely. Give back to the community. Begin with a real passion and a clear goal for what you want to accomplish. Take a step forward. See what you can learn from it. Take the next step. Patience. Planning. Persistence. And maybe a little northern Idaho magic.